The Achievement Center for Therapy is dedicated to helping children of all capacities reach their full developmental potential for communication, enabling them to increase their independence in everyday activities, increase interaction and participation with their families, and improve the overall quality of their lives. Once evaluated, we will determine a plan of action that is best for your child based on their age, capabilities, and challenges. Our engaging therapy sessions will set your child on a path of progress, utilizing both traditional and technology-based activities for a well-rounded approach. Mealtimes are a constant battle. They are very selective about foods they will eat and are not getting adequate nutrition. They are failing to gain weight at the expected rate or are low on the WHO growth chart. They have sensory disorders that make certain foods a challenge. They have complex medical diagnoses. They have oral-motor delays and deficits. Our feeding therapy programs average 8-12 weeks in duration, with sessions held once a week up to five days a week depending on severity. We also train parents and caregivers on how to respond in problematic feeding situations and encourage positive behaviors. We always involve the parent and/or caregiver in these sessions, so they can learn specific strategies for their child’s challenges, becoming a partner in their success. We invite you to contact us and see how we can collaborate to help your children grow and thrive. Pediatric occupational therapy helps children gain independence while also strengthening the development of fine motor skills, sensory skills, and visual motor skills that children need to function and socialize. Occupational therapy can benefit children who fall into several categories– from premature infants to kids with ADHD or other attention disorders, to children struggling to read or write. Achievement Center for Therapy occupational services always incorporates play into practice to make therapy fun! Such play can involve games, toys, puzzles, songs or physical exercises in our state of the art sensory-motor gym. In all cases, the goal of pediatric occupational therapy is not only to help children adequately progress but to challenge them appropriately, helping to build self-esteem and confidence when it comes to their capabilities and aptitude. Does your child have difficulties with day-to-day activities at home, school, or in the community? Do they experience challenges that do not affect most typically developing children? If so, our occupational therapy team may be able to help your child. They aren’t reaching developmental milestones such as sitting, crawling, and walking, etc. They struggle with fine motor skills such as manipulating toys, holding a pencil, using silverware, etc. They have difficulties with movement, strength, and/or balance and appear clumsy or uncoordinated. They avoid tasks and games that require gross motor skills. They struggle with oral motor/oral sensory skills, presenting as difficulty chewing, difficulty drinking out of a cup, and/or tiredness after eating. They showing difficulty with sensory processing — presenting as either over- or under-stimulated. The Achievement Center for Therapy offers effective alternatives to treating children with autism spectrum disorder. Our therapy sessions are personalized depending on each patient’s needs, consisting of targeted social skills training, and a variety of specialized techniques to help children with many different diagnoses. Speech-language therapy can have a crucial role in the treatment of a child with autism. In therapy, we target and address two primary characteristics of autistic children which include difficulty with communication and social language skills. The Achievement Center for Therapy specializes in Augmentive-Alternative Communication for both children and adults, with the goal of helping every voice be heard. We offer consultations, evaluations, therapies, and trainings aimed at patients, parents, and professionals. Using technology, we help enable people with disabilities, giving them independence, privacy, and a means to make choices in all aspects of their lives. ACT provides a successful and exciting approach to this type of technology-based speech and language therapy, creating our own apps for use during and after therapy sessions. These Speech Wizard apps are designed to assist children and adults with communication delays and disorders, using fun and engaging activities to build their skills and confidence with articulation and sounds. The Speech Wizard has two apps available for use now and is developing companion apps that will be released in the coming months. At Achievement Center for Therapy, we strive to provide the most up to date – clinical and medical treatments available. 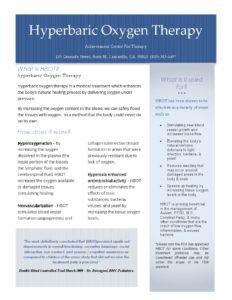 With this in mind, we have seen promising results from Hyperbaric Oxygen Therapy (HBOT) as it relates to managing the symptoms of Autism. We now have a full hyperbaric facility right in our center. Our therapists provide Mild (low pressure) HBOT treatment protocols per the current recommended standards as outlined in several major studies on Autism and HBOT therapy. In addition to managing Autism, our center can provide hyperbaric oxygen therapy for a variety of conditions. Please visit the HBOT link from our page to learn more. Speech-Language Pathologists are an essential part of the team in many concussion cases. Speech-Language Pathologists, or SLP’s, are not only specialists in speech, language, swallowing, and voice, but we are also cognitive specialists. Concussions are often called mild traumatic brain injury (mTBI). The term “mild” refers to the severity of the original physical trauma and does not indicate the severity of symptoms following the injury. Some of the many impairments following a concussion can include deficits in some or several of the following: speech, language, cognitive processing speed/efficiency, information processing, executive functioning, attention, memory, planning, concentration, mental flexibility, and swallowing. These deficits affect every aspect of an individual’s life — from getting ready in the morning to performing in school or the workplace. For concussion management, we offer formal evaluations of speech, language, and cognitive/communicative skills, and offer specialized treatment plans to combat concussion short-term and long-term effects.